At age nine, I was a painfully shy tomboy who, despite fifth grade level test scores, was deemed socially unfit to skip the fourth grade at my new school in California. To overcome my social awkwardness, I came up with a plan: discover what was cool to these California kids. By then becoming an expert on said cool subject, I could be cool too. To be clear, I wasn't starting from scratch. In New York I sat at the back of the bus with the older kids, and I was never the straggler in getting picked for sports teams; I did alright for myself. But this was a new place, and I knew my swagger would take a while to resurface. It did take some time that first year, but I found a place at my new school. I had friends to spend recess with each day, and I did well in my classes. I was cool enough. Then in the fifth grade, I discovered skateboarding. The boys in class brought in skate magazines of all kinds. Between class and during recess, they'd pore over obscenity-filled Thrasher, Skateboarding, and king of them all, Transworld Skateboarding; they'd obsess over CCS catalogs flipping through pages of shoes, decks, and wheels until the pages disintegrated. Meanwhile, I'd peer over their shoulders plotting my ascent to greater heights of cool. I soon asked my parents for a skateboard of my own. They took me to K-Mart where I bought the crappiest skateboard known to man. Zero concave, slow bearings, and thuddy wheels. But hey, no one said attaining cool would be easy. I wore my Nike sneakers and tore them to shreds learning to ollie. My mom bought me skate mags at the grocery store, and I studied their pages with intense concentration. For those unfamiliar with skate literature, Transworld Skateboarding is like the Vogue of skate magazines. It's comprised of forty percent ads and sixty percent content, but both are equally important. Through my Transworld education, I soon knew which skaters rode for what teams, who was Pro and who was Am. I could identify any pair of skate shoes walking down the street. At the ripe age of eleven, I could even distinguish the skaters whose daring stunts were propelled by drugs. I think I shocked the boys with my with encyclopedic knowledge of skateboarding. "What kind of deck do you have?" "Alien Workshop," I'd answer proudly. (I got a new board after I learned to ollie). I've transitioned to riding a longboard now. It's the Cadillac of skateboards, a smooth luxurious ride for old people. I don't really get a chance to cruise around very often. So instead, I find myself poking around the internet for scraps related to skateboarding in news or art or music. The severe economic downturn has forced many people to reassess their values and the ways they act on them in their daily lives. For some, the pursuit of happiness, sanity, or even survival, has been transformed. Happy Days is a discussion about the search for contentment in its many forms — economic, emotional, physical, spiritual — and the stories of those striving to come to terms with the lives they lead. The "search for contentment!" This is something I can identify with. So when I read the today's post about the death of NYC skateboard pioneer Andy Kessler, I couldn't help but remember my own experiences with skateboarding. I have framed skateboarding for me as a "vehicle to cool," but it wasn't just that. I couldn't have delved so deeply into it if not for my own genuine fascination with skate culture, its creativity, and its artfulness. 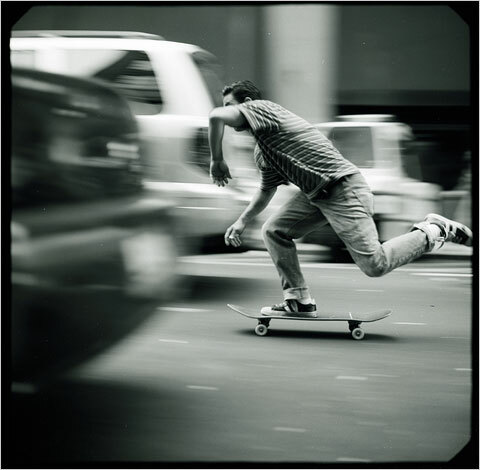 Andy Kessler embodies the sort of attitude that I admire about skateboarding. It's the attitude conveyed in the picture of Andy Kessler above, and it's the attitude I think a lot of us, including myself, need right now. The bee got him, but the hard times didn't. Skate on, pals.